American manned lunar orbiter. Study 1962. 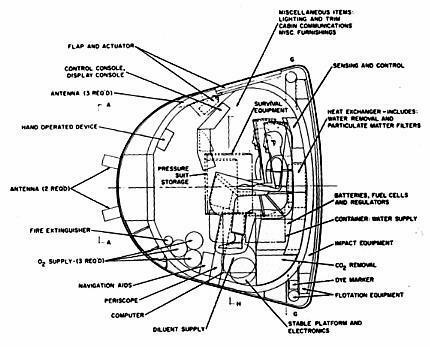 The General Electric design for Apollo put all systems and space not necessary for re-entry and recovery into a separate jettisonable 'mission module', joined to the re-entry vehicle by a hatch. Status: Study 1962. Gross mass: 7,470 kg (16,460 lb). Height: 10.18 m (33.39 ft). Every gram saved in this way saved two or more grams in overall spacecraft mass. In comparison with the NASA final Apollo design, the General Electric D-2 provided the crew with 50% more living space, an airlock, and a service module for the mass of the Apollo capsule alone. But in the end, NASA administrator James Webb examined the model of the D-2, thanked the contractor for its efforts, and announced that Apollo would use the NASA design without any consideration of alternatives. The Soviet Union used the General Electric design approach for their Soyuz spacecraft, still in service 45 years later. The NASA Apollo deign was retired after 8 years. The General Electric design for Apollo put all systems and space not necessary for re-entry and recovery into a separate jettisonable 'mission module', joined to the re-entry vehicle by a hatch. Every gram saved in this way saved two or more grams in overall spacecraft mass. The 2183 kg re-entry vehicle used a shape of the highest possible volumetric efficiency and was only 2.88 m in diameter and 2.40 m high. The end result was remarkable. In comparison with the NASA final Apollo design, the General Electric D-2 provided the crew with 50% more living space, an airlock, and a service module for the mass of the Apollo capsule alone. Fueled for the circumlunar mission, the entire 10.18 m-long spacecraft weighed only 7,470 kg. But in the end, NASA administrator James Webb examined the model of the D-2, thanked the contractor for its efforts, and announced that Apollo would use the NASA design without any consideration of alternatives. The Soviet Union used the General Electric design approach for their Soyuz spacecraft, still in service 40 years later. The NASA Apollo deign was retired after 8 years. Put all systems and space not necessary for re-entry and recovery outside of the re-entry vehicle, into a separate jettisonable 'mission module', joined to the re-entry vehicle by a hatch. Every gram saved in this way saved two or more grams in overall spacecraft mass - for it did not need to be protected by heat shields, supported by parachutes, or braked on landing. Use a re-entry vehicle of the highest possible volumetric efficiency (internal volume divided by hull area). Theoretically this would be a sphere. 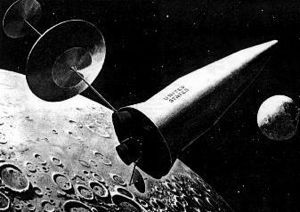 But re-entry from lunar distances required that the capsule be able to bank a little, to generate lift and 'fly' a bit. This was needed to reduce the G forces on the crew to tolerable levels. Such a maneuver was impossible with a spherical capsule. After considerable study, the optimum shape was found to be the 'headlight' shape - a hemispherical forward area joined by a barely angled cone (7 degrees) to a classic spherical section heat shield. The end result of this design approach was remarkable. The Apollo capsule designed by NASA had a mass of 5,000 kg and provided the crew with six cubic meters of living space. A service module, providing propulsion, electricity, radio, and other equipment would add at least 1,800 kg to this mass for the circumlunar mission. The General Electric D-2 provided the same crew with 9 cubic meters of living space, an airlock, and the service module for the mass of the Apollo capsule alone! The modular concept was also inherently adaptable. By changing the fuel load in the service module, and the type of equipment in the mission module, a wide variety of missions could be performed. In the United States, the earliest manned capsule ballistic designs already exhibited the range of shapes that would be flown later. 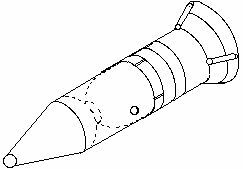 In response to the US Air Force Manned Ballistic Rocket Research System request for proposal in February 1956, Lockheed, Martin, and Aeronautics proposed a blunted warhead re-entry vehicle form like that used later for the Discoverer/KH-4/Corona film recovery capsules and Biosatellite. 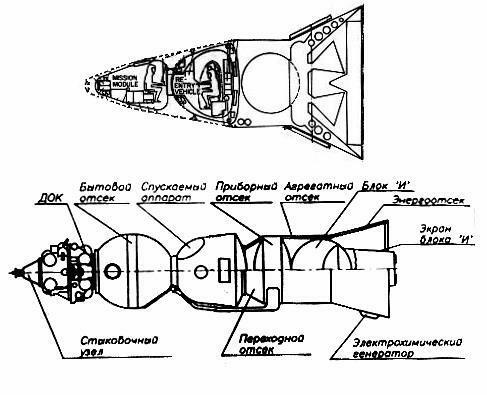 McDonnell proposed a shape very like the later Soyuz 'headlight' (but with a heat shield that extended a bit around the base). 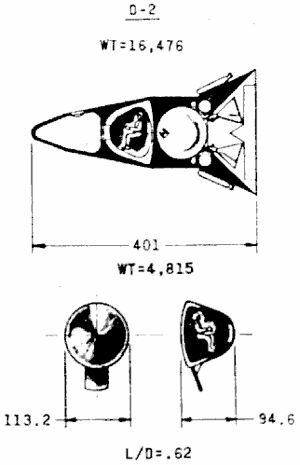 Avco, Goodyear and Convair proposed spheres, like that used for the Vostok spacecraft in Russia. Bell, North American, Republic, and Northrop all proposed winged vehicles. While this window-dressing was going on, NASA Langley had already decided what the design would be. Max Faget, together with designer Caldwell Johnson, had decided, in the words of Ulysses S Grant, 'it's not what you decide, it's to decide'. And they decided that their capsule would be conical and had a diameter of 160 inches to match the last stage of the Saturn C-2. Later, when the diameter of the C-2 was reduced to 154 inches they rounded the corners to fit. And that was it. While the contractors invested millions of their own money, studying alternatives, doing trade studies, Johnson had already produced design drawings virtually indistinguishable from the Apollo CM that would fly six years later. All of the anguishing discussions that would follow after the decision to go to the moon - the mode debate (direct landing vs. earth orbit rendezvous vs. lunar orbit rendezvous), the launch vehicle debate (Saturn C-3, C-4, C-5, Nova), and so on took as the starting point the 5,000 kg Langley Apollo capsule. As was usual, the customer spent almost as much time studying the bids as the contractors spent creating them. On 24 November, reflecting mainly the extent to which each competitor had followed Langley's design, the formal bid evaluation was completed. The 'scientific' bid ratings were: Martin 6.9; General Dynamics 6.6; North American 6.6; GE 6.4; McDonnell 6.4. Martin was unofficially passed the word and announced to its cheering workers on 27 November that they had won the contract. However a funny thing happened on the way to the White House, and when the contract award was announced on 28 November, North American was awarded the prime contract. General Electric folded up its tents and went back to building re-entry vehicles for military programs. Seeking professional recognition for their work, Arthur and Abel publicly documented their D-2 design by presenting papers the following December at a special symposium of the American Astronautical Society in Denver, Colorado. Family: Lunar Orbiters, Moon. Country: USA. Launch Vehicles: Saturn I, Saturn V. Agency: GE. Bibliography: 202, 2300, 26, 6346. 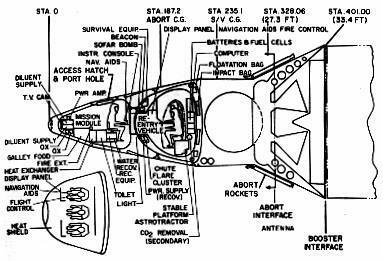 Cutaway views of GE Apollo D-2capsule.